This year 2014 has seen the publication of “Cancer is my Teacher” – an extraordinary book by a brave and accomplished author Lucy O’Donnell. It couldn’t have been an easy task – because cancer is such a nasty and frightening word. In a vibrantly intelligent book the author has given hope to literally millions of people. In interviews included in her book Lucy O’Donnell has described her harrowing experience when she went to her hairdressing salon – eerily quiet except for the whirring hum of the hair dryers. Stylists avoided her gaze – their heads down, cutting and primping – turning away. The massage therapist was silent and said nothing – not even when she took her wig off to reveal her bald head. “Are you alright?” she eventually asked. She wasn’t, and said so. It was an awful experience and she couldn’t wait for the massage to be over and hurried out in tears. This stunned reaction is something the author has learned to recognise. Lucy O’Donnell was diagnosed in November 2011, when she was 46, with breast cancer. The disease had already spread to her bone and there were tumours in her liver. She cannot ever be cured. She will have cancer for the rest of her life. Everyone in the hairdresser’s salon that day knew that she was extremely ill. They had all been talking about it. In truth she should really have been sorry for them because they were all so full of their own fear. It would have been much nicer if they had just said “I’m so sorry to hear what you’re going through”. But they didn’t. It wasn’t pity she wanted at that moment. But acknowledgement is important. It would only have taken seconds and she would have felt so much better. Lucy O’Donnell is no ordinary woman. She is a wife, a mother, a successful woman who has created a multi award-winning granola business, a former “Entrepreneur of the Year”, and now a very successful author. 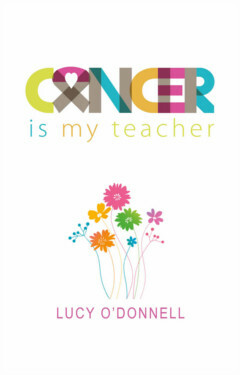 “Cancer is my Teacher” is a book that everyone should read. It is not just a lesson on how to survive – it is a lesson on how to live. This is an extraordinary book, written by an extraordinary woman with wisdom, humour and honesty. Above all it’s written with love. Lucy O’Donnell has lived with cancer for 3 years and rather than letting it crush her, she’s let it teach her. What she has learned is fascinating, about herself, about others but most vitally about love. On one level it is a very practical guide. There is nothing more terrifying than the unknown. For those diagnosed with cancer she takes you by the hand and tells you what to expect. The sort of things you’ll never find in books. The sort of things no one would think of telling you. She shares everything, shining a warm light into what is so often a dark and frightening tunnel and gives advice about making the whole experience less traumatic. For those whose loved-ones are diagnosed with cancer she also takes you by the hand and tells you how best to support them. Her own account of friends crossing the street to avoid her because they don’t know what to say is shattering. But she writes with compassion, understanding and a genuine desire to help from the very bottom of her heart, which is very big. I laughed and cried when I read it – but I learned so much. It gave me a deeper insight into those suffering with cancer and how I could be there for them. It also reaffirmed what I already know to be true, that when life is condensed down to its very essence there is only love. The human spirit is bigger and brighter and more incredible than we can imagine – Lucy O’Donnell’s is proof of that. Lucy O’Donnell has achieved something special in this outstanding book, a commitment to helping cancer sufferers help themselves: striking a balance between the uncertainty and even despair at the diagnosis of advanced cancer and the maintenance of optimism as stages of treatment were completed she presents with courage and practical advice the road map for keeping a steady nerve whilst aiming for remission if not total cure. Some of what Lucy describes is a white knuckle ride for the unwary: nothing can prepare a person with cancer for the tumult of emotions that can overwhelm at times, but Lucy attempts this with a frank and detailed approach- and this is so often missing in medical care where the value of careful communication is so often lost in the pressure of the moment and the complexity of what has to be achieved. Lucy achieves her ends in spades- there are areas where even the best of health professionals cannot help, and Lucy O’Donnell found that cancer was her teacher- so let her join forces with that and help you or your loved one along the journey. This is a wonderfully moving but also practical guide. Not only does it detail the physical and medical milestones, but it is a powerful and illuminating meditation on the inner journey of the cancer sufferer. I think everyone who reads it will find it quite exceptional.